Two luxury diesel hatchbacks / tourers vying for the attention of a customer with a budget of 30 lakhs. So, which would you choose – the Angel or the Imp? My school days make for some of my fondest memories. Arriving late to school the punishments endured, and this even led to some visits to the Principal’s office – seemingly harsh as this might sound, these are some of the things that defined my childhood. My sister, on the other hand, was a straight ‘A’ grader, and the only time she went to the Principal’s office was when she received her award for the best student in school. Imagine the misery of my mother (and it’s only now that I sympathise with her), when she was called to school during parent-teacher meetings. Two minutes is what it took her to visit my sister’s class. The teacher, undoubtedly very happy with her progress, had little to say other than high praise. Mom walked out happy, while patting my sister’s back. The smile vanished as soon as she entered my class. There wasn’t one teacher who did not want to talk to her. They never talked about my report card, rather they focussed on my behaviour and tortured my mom by bombarding her with useless information like the time I casually nudged another student in the jaw, which set two of his teeth flying, or even the time when I brought out my artistic side by painting a blue coloured tree on the back of the shirt of the person seated ahead of me. Teachers didn’t appreciate this, and from what usually progressed at home, post such meetings, I gather my mom didn’t either. She always understood, though, that my sister and I were two different individuals. It’s a theory that I put to use when I drove the diesel-powered Mercedes-Benz B-Class and the MINI Countryman. The theory of the Angel versus the Imp. Mercedes-Benz brought the B-Class to India last year, and though it catered to the petrol-head then (with the B180 Sport), the overall style, space, and practicality is far more suited to being a family hauler. Now it’s upped the ante (for sales), by introducing a diesel powered version of this luxury hatchback / tourer (as Mercedes likes to call it). There are certain things about Mercedes cars that you come to expect, and the B-Class carries on this tradition. It’s a sombre looking thing – not too jazzy, with just the right amount of buzz surrounding it. Inside, the B-Class is fairly spacious. 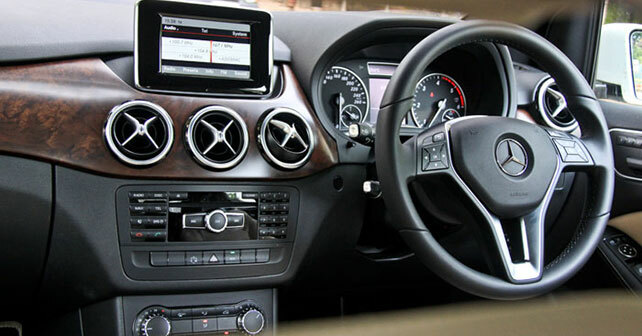 It comes with a fully powered driver’s seat, leather upholstery, seven airbags, a COMAND interface with a variety of media connectivity, and a bunch of safety tech like ABS, Brake Assist, Hill Start Assist, and many others, which Mercedes has not compromised on. But there are some things that the B-Class diesel does not get – such as the dual-sunroof setup and the 17-inch seven twin-spoke light alloy wheels. Plus, the wood trim of the interior is quite an eyesore to be honest. The B gets the ubiquitous 2.2 litre diesel engine, which churns out close to 107bhp and 250Nm torque. You crank the engine, and are met with a fair amount of noise and vibration. It wasn’t clear whether this was a problem with our test car, or whether this is wider problem. Either way, refinement could be better. The engine responds decently to your inputs though – but with only 107bhp, its never going to set the road on fire. So, while it is decent enough to use in the city, it doesn’t feel as impressive on the highway. The gearbox too is tuned less for enthusiast driving, and more for everyday duties. All that said, the ride quality cannot be questioned – it’s so smooth that you just want to sit back and enjoy it. 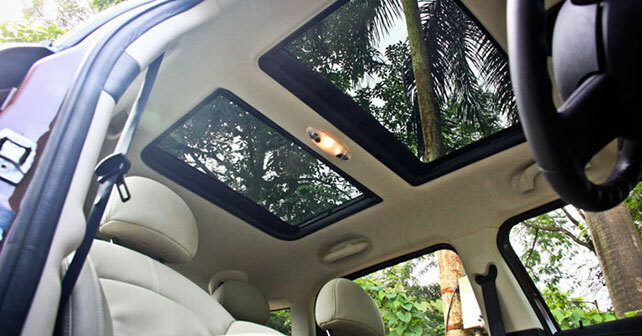 It’s a calm and collected car – no hanky-panky. So, in my mom’s book, an Angel (just like my sister)! Before I get into the nitty-gritties, there are a few facts that you ought to know about the Countryman D. It’s the first Mini to be assembled in India, and while it looks like a hatchback, it’s longer than 4-metres and is also the first Mini to get five doors. With all this at the back of my mind, I pushed the key in the slot and saw to it that it was wide awake. Once that was done, I was greeted by an extrovert of a dashboard. 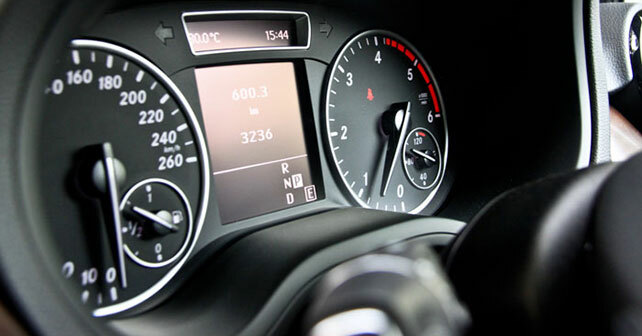 A centrally mounted oversized speedometer, and the graphic display that it incorporates within it, blows your mind. I was especially intrigued by the toggle switches mounted both on the roof, and below the speedometer. Even the handbrake resembles the thrust lever of a fighter jet. All I needed now was a pair of headphones, and an affirmative that the runway was cleared for take-off. 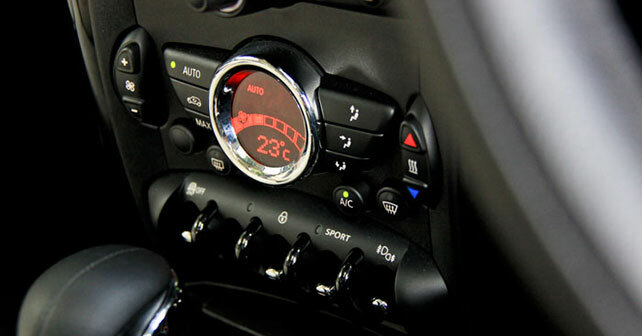 All the funkiness that’s missing in the B-Class, well, the MINI Countryman D compensates for it. It’s quite well equipped too, and comes with Bluetooth connectivity, climate control, a sunroof, paddle shifters, and a driver interface system that’s similar to BMW’s iDrive. It gets a Harman/ Kardon sound system that makes you want to turn up the sound and bounce to the music. After the toggle ogle, it was time to get down to business and see for myself what this 1,995cc, four-cylinder common-rail diesel was all about. It was a different approach when it came to this one. It was eager to go, and I had about 112bhp to deal with. There is a rush of power too when you press the throttle initially, and that might be an issue when it comes to slow-moving traffic – but once you’re out on an empty road, you have nothing to complain about. There is no hesitation, it does what you expect a Mini to do – just go. 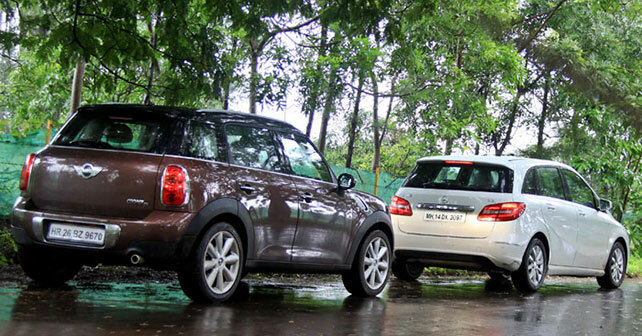 It takes a while to get used to the way the Countryman handles – but it is, what I can only describe as, entertaining. The steering is sharp, quick, and feels heavy at low speeds. The engine is responsive, and it keeps you on your toes because sometimes it feels as though it has a mind of its own. The ride quality is quite offbeat though. Considering that Indian roads are never flat, or flattened out, it thumps and tosses you around due to the stiff suspension and low-profile 18-inch tyres. The ride quality improves as you go faster, but essentially it’s not the most comfortable car around. So, technically, you have to drive it fast to enjoy it – and what else could you ask for in a car? As mom explained to many of my teachers, “You have to really get used to the mischief he creates, and only then can you fully understand him.” And this is why the Mini Countryman D becomes the Imp. I admit, I loved both cars, and, unlike my mother (who couldn’t show favouritism then), I can choose my favourite. The B-Class is sincere, it’s comfortable and angelic, but I will give the Devil his due – as I can fully understand the charisma and the mischief that the Countryman brings to the table. Everyone loves the Angel of course, but waits for the Imp to arrive for the party to begin. In short, Imp trumps Angel. I’m sure my sister disagrees though!